Visiting hours – when can families visit? We have an open door policy at Cedarcrest. You may visit at any time as long as you are considerate of all residents. We encourage all families to visit and take patients on outings. Overnight outings, or even for just a meal at their favorite restaurant, is always a special time for a nursing home resident. How do I admit someone to a nursing home? When you find a nursing home that fits your needs, it is important the facility has medical information about the patient to properly assess their medical needs. You will need to sign a medical release with the individual’s doctor or hospital. An “assessment” means that we will request past medical history, current medications, labs & tests, and recent hospital stays. After receiving the medical information, Cedarcrest will look at the information and determine if we can meet the patient’s cognitive and physical needs. My loved one cannot afford nursing home care, how do I apply for Medicaid? Once a patient is admitted to a nursing home, Medicaid or financial assistance can be applied for through the Department of Human Services. Cedarcrest will send the original application to DHS at the time of admission. The family, guardian, or power of attorney, will receive a letter from DHS regarding the application and will request a meeting. Contact the caseworker within the designated time frame. Prepare the information required (you will receive a list from DHS with your letter) and make sure you don’t forget your appointment. Until my parent is approved for Medicaid, how do we pay for nursing home care? During the “pending process” of Medicaid approval, we understand that the patient cannot pay the full amount for nursing home services. DHS requires the following payment: Total monthly income of the patient to be paid to the care center. $50.00 per month can be withheld for personal expenses. Example: Patient receives $500.00 per month from Social Security, $250.00 retirement benefit. Total income is $750.00. Pay the nursing home $700.00 each month, use $50.00 for personal items for the patient. When Medicaid reaches a decision about the possibility of financial assistance, you will be notified by a letter. This letter will tell you the date the Medicaid assistance will start and how much the patient is responsible for paying the nursing home each month. At the time of approval, the care center will bill Medicaid for every month that full payment was not received from the patient. Do I need a Power of Attorney or Guardianship to bring someone to a nursing home? No, it is not required but it is important to have and should be considered if you are caring for a loved one. However, as a child or spouse of a nursing home patient, a Power of Attorney is a great future investment. This legal document will save you time, energy and frustrations. Because of our changing laws, a POA is necessary to have access to medical records. It also provides assistance for the nursing home patient who is unable to make financial and medical decisions. As people become older and mental status’ change, it is very helpful to have someone to help mediate and make decisions for those who are incapacitated. It is important to get this document now – before you need it! Changes happen quickly and it will be too late if you wait for the patient to become sick. Who qualifies for nursing home care? Anyone who requires more assistance than they are receiving at the present time; they qualify for nursing home care. Another indicator may come from a physician who will recommend “around the clock” care. 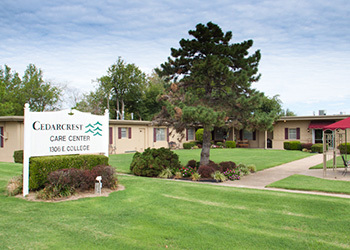 Nursing home care is 24-hour nursing care. If a person is recovering from a hospital stay, illness, or experiencing Alzheimer’s type behavioral problems (ie decreased nutrition, increased wandering and memory loss, constant supervision required) nursing home care is a good option. We strive to create social programs and individualized activities to match the capabilities and needs of each resident. This also has a powerful impact on the healing process of those residents involved in some type of rehabilitation. Specific activities include: musical performances, current events update, reading the newspaper, singing exercises, fitness activities, stretching exercises, religious meetings, outside entertainment, games, trivia, and history. We also strongly encourage families to participate with the residents in various activities. A monthly calendar is posted to keep residents informed of upcoming events such as birthday parties, movies, musical programs, family night, ice cream socials and other special events. We always welcome friends and families to visit and attend special events. Should you wish to have Cedarcrest Care Center wash the laundry please notify the front office upon admission. Subsequently, if a family/caregiver is going to take care of the laundry at home, please let the nursing station know your plans. This way, the staff can place a sign on the closet door notifying our housekeeping staff to leave the clothing for family pick up. We request that family provide a hamper for clothes and pick it up twice a week. What personal items should I bring for someone living in the nursing home? Glasses & Dentures – if your loved one wears them, then please bring them. We encourage children to visit, however, we ask you to pay special attention to visiting children under the age of 12. Noise levels should be kept at a minimum. Running in the hallways or wandering in residents rooms is a problem. We would love for your family pet to come to visit. Please remember to clean up after them and take the proper safety measures at all times. All pets are to be kept on a leash and should have all current vaccinations. A copy of pet vaccinations needs to be kept in the Business Office. Mail is delivered to residents personally on a daily basis including weekends and holidays. For the safety and welfare of all residents and staff, Cedarcrest Care Center is a non-smoking facility. There are no designated smoking areas in outdoor areas. If you must smoke, please smoke in your vehicle and dispose of cigarette butts responsibly. There is ample parking in the parking lot with wheelchair access. Please observe all posted designated signs. Yes, we have onsite beauty care. Residents may bring their own TV from home, basic TV channels are provided. Residents may bring in their own telephone and set up service at their own expense with the local phone company. Cedarcrest Care Center has a vibrant atmosphere with dynamic, individualized activities that match the capabilities and needs of residents and their guests. We also have an active resident council. Scheduled activities include music, fitness activities, religious meetings, outside entertainment, games, and gardening. If you would like to arrange something special or have suggestions and ideas for individual or group activities, please inform our activities director. We welcome and encourage involvement from family and friends. Should you wish for another food item on a particular day’s menu, please make the Dietary Staff aware of your request. This information will be passed on to the Food Service Director and they will try their best to accommodate needs. Our primary concern is that your loved one feels comfortable here at Cedarcrest Care Center and that their needs are being met. You should feel secure and at ease with our staff, particularly those providing direct care. If you have any concerns or praise for our staff, please contact our Administrator or Director of Nursing. They will be able to address any apprehensions you may have regarding any particular staff members. Cedarcrest Care Center employs a full-time Business Office Manager for all financial and billing concerns. Should you have any questions regarding these matters please make an appointment to see our Business Office Manager by contacting the front desk/receptionist. The Business Office Manager will guide you through the necessary forms required on admission and review the rules and regulations regarding Medicare, Medicaid, and various insurances. An RN’s duties may include everything a CNA and LPN carry out, assessment of residents, skin care, and processing doctors’ orders. Furthermore, RN’s typically take on management positions such as the Director of Nursing, who is responsible for all nursing duties in the building.